Preheat oven to 375 ~ dust pie pan with flour and line dish with pie shell. Sprinkle cheeses over pie shell. Next prepare spinach mixture with saute onions in butter and place over cheese in pie shell. Next beat eggs ~add salt, pepper, nutmeg and dillweed. Pour over spinach. bake until filling is set, about 50 min. Cool and serve. I also like to add other veggies like asparagus and creme cheese is wonderful added in the spinach mixture. Just play with it ~ so many yummy possibilities!!! 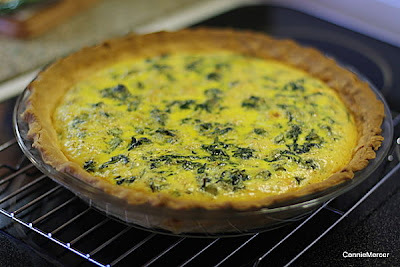 I have been super busy scrapboooking, but can't show anything yet but I will have something "way cool" for Try it Tuesday so in the mean time ~ make a quiche!!! Thanks for the recipe. I love quiche and this does look easy. Hello Connie! Just stopping by to thank you for leaving a comment on my blog this past weekend during the Sketch Support blog hop! I was giving away a copy of the latest volume of Sketches for Scrapbooking......and you are the winner! Contact me at scissorsandtrimmers@gmail.com with your shipping information and I will get it in the mail to you right away. ok now i'm hungry. lol!!! oh congrats on winning!!! can't wait to see your stuff!! you're such a tease. I love quiche, too. Thanks for posting. I will make this one for sure. This quiche looks sooo good. Oh my, I love quiche and that looks delicious! Yum! Try it Tuesday~Tim Holtz configuration box! !